Here is another print on MUSEO paper. The size is 5 x 5 inches. Interested? contact me. this is so beautiful! i hope i am doing this right! i will email you my address and stuff! thank you for the offer! thanks nancye, cant wait to have you there! Hi, I just nominated you for a blog award. Check my blog for details!! I love your work!!! Lovely angel! I like your style. 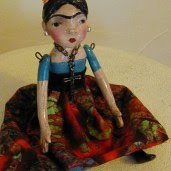 I am also a member of Suzi Blu workshop that is where I saw your art first now I found your blog. Very nice! I remember that you once sold a set of cards. I would love to make some cards with my paintings, but have no clue.